Though decision-making may at times seem like a somewhat irrational process, careful observation can reveal predictable patterns governing consumers’ behavior. One tool that can help identify consumers’ decision-making processes is a decision map. 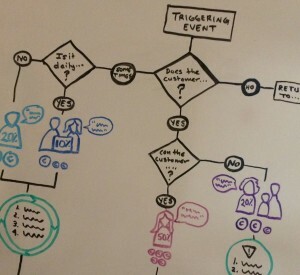 Decision maps are visual illustrations of the interaction between consumers’ key decision points and a number of factors that influence these key moments. These factors may include consumers’ thinking-based evaluative processes (i.e. how they assess and weight information), emotional goals and needs, social interactions, as well as information-seeking and sense-making processes. Decision maps are created from largely qualitative research methods such as in-depth interviews and contextual inquiry, but they can also be informed by website and search analytics. Identify distinct patterns of consumer behavior. Decision maps show where consumers’ behavior patterns converge or diverge across different audience segments. They yield insight into the proportion of consumers that demonstrate certain behaviors, the timeline in which these behaviors occur, as well as where and how to best target them. This informs design by showing how to adapt your website to appeal to and serve multiple behavior patterns concurrently. Pinpoint what search terms and types of content consumers are searching for. Decision mapping can help reveal what search terms and types of content consumers are looking for. Knowing how consumers navigate to and between content categories directs information architecture and development. Confirm what consumers’ most value. More importantly, decision maps can act as a gauge to test whether your content is aligning with what consumers most value. They help ensure that your site is delivering the right value proposition and can indicate whether your site content, imagery, and multi-media is persuasive. The decision mapping process also helps to evaluate certain content qualities as content depth or breadth, specificity, message-framing, tone, rationale, and emotional impact. Clarify how your users want to connect with you. Decision mapping can help to reorient the perspective from how you want to connect to consumers to how consumers want to connect to you. Mapping identifies the most current influential marketing channels as well as the prospective most influential channels. Mapping also serves as an indicator as to which brand touchpoints are resonating with consumers as well as which ones they’re missing. Insight into how and where to connect with consumers at critical decision points facilitates creating effective calls to action that will motivate consumers to take action. Being there at the critical moment when a consumer is ready results in conversions. Reveal competitors’ best practices and weaknesses. Another advantage of the decision making process is in understanding what is or is not working on competitor websites and within competitor marketing campaigns. Consumer decision making is often a comparative process and learning how consumers react to competitors can be a very informative learning experience. Point toward what qualities you need to track and measure to ensure website efficacy. Decision maps can discover what key performance indicators you should track and measure across which marketing and business channels to ensure customer satisfaction. As you make iterative changes on your website, these indicators can act as a barometer of your site’s overall efficacy. It is dangerous to guess or assume what your consumers think, feel, and need – especially when your consumers may be “predictably irrational.” Decision mapping is a very powerful tool that can act as a compass directing you to where and how to add value and connect with your consumers. The data collected from the decision map process ensures your marketing efforts are aligning with consumer needs – creating the best opportunity for conversions.